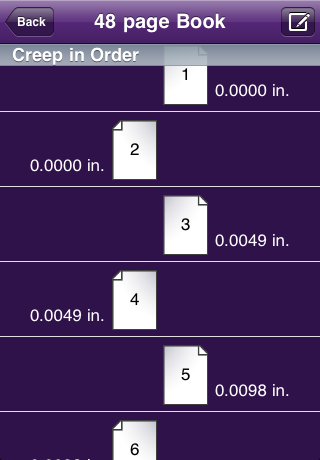 This calculator helps you figure out the amount of page creep for a booklet (aka shingling or pushout) for a number of pages and a given stock thickness. This helps you figure out the safe area of your pages so that folios or other artwork won't get too close to the final trim of the booklet. 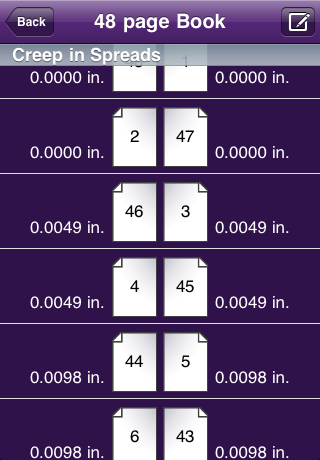 Handy tables can be viewed in single pages or printer's spreads with the amount of creep per spread. Enter your total page count of your booklet. Enter the thickness of one sheet of paper. A Creep Modifier of 1.4 is a good start for uncoated text weight stock. This compensates for tolerances of folding equipment. Clicking either the single pages or printers spreads button will show you the pages and their individual creep values. Run the script from the Automation/Scripts pane. Enter the total creep into the dialog for the script to place guides on your pages.